Traveling through heavily glaciated terrain with just one other person on the rope can be challenging. 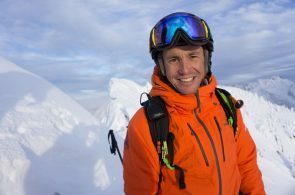 If someone falls into a crevasse, you only have one chance to catch him, and only one person on the surface to perform the rescue. This article originally appeared in Rock and Ice issue 239 (January 2017). Traveling through heavily glaciated terrain with just one other person on the rope can be challenging. If someone falls into a crevasse, you only have one chance to catch him, and only one person on the surface to perform the rescue. Of course, the best way to deal with the situation is not to fall into the crevasse in the first place. Proper route finding, moving during good travel conditions (good visibility and freezing temperatures), and using a probe to assess where bridges are solid are all good techniques for avoidance. That said, crevasse avoidance is a bit of an educated guessing game, and you may find yourself in a situation where you are your partner’s only hope for getting out of a dark, scary hole. Butterfly knots tied in the rope can jam in the track carved by the rope and catch a climber falling in a crevasse. The number-one rule for crevasse rescue is: Don’t follow that person into the hole when trying to catch the fall. Give yourself enough space between climbers to have time to react. 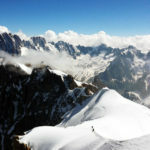 The amount of rope between the two of you varies depending on the size and complexity of the glacier, surface conditions and the relative size and skill of the climbers. 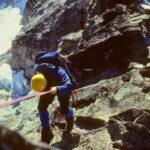 Too much rope out and you can’t move efficiently, and if a person does fall into a crevasse he will take a longer fall. If you have insufficient rope out, you may end up in the hole yourself. Once you have caught the fall, the next step is getting your partner out of the hole. Sometimes this is as easy as holding your partner’s weight while he climbs out using tools or with ascenders or prusiks. If your partner can’t climb out, you have to haul him out. 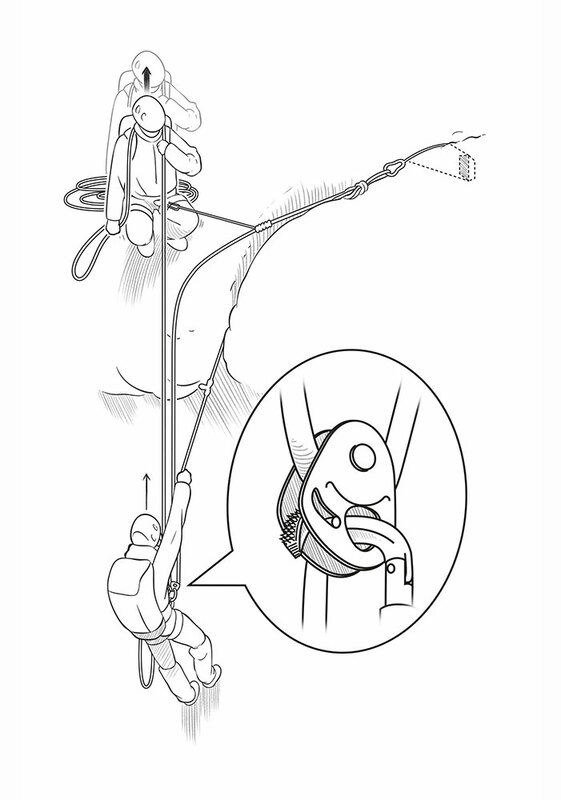 Here is a fast and effective system for a single-rescuer crevasse rescue. 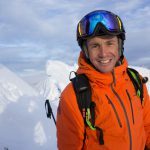 This method eliminates nearly all lip friction, which is often a problematic obstacle to performing crevasse rescue. 1. AN IMPORTANT WAY to hedge your bets in a rope team of two is to tie butterfly knots in your rope. 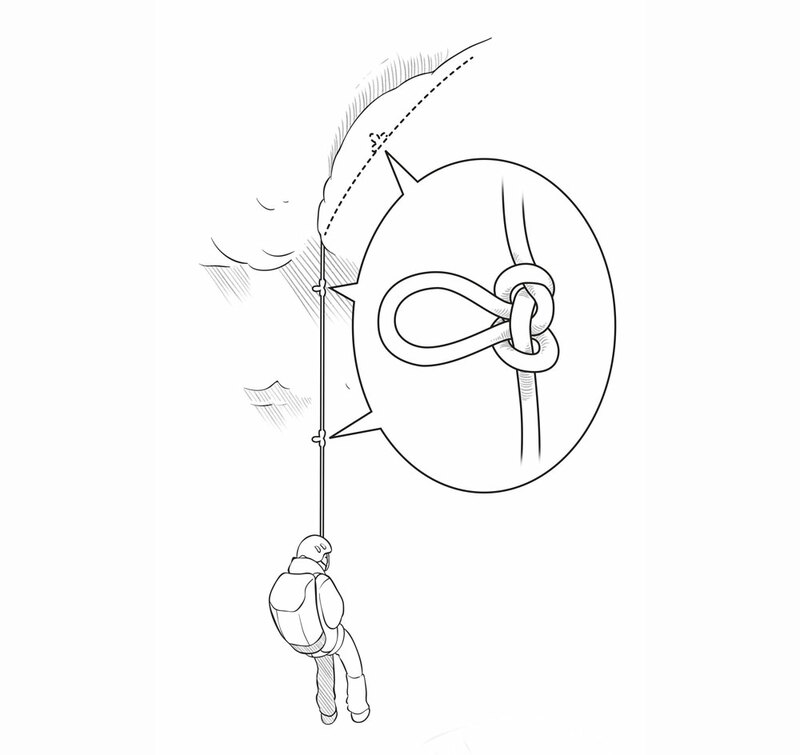 These knots work as stopper knots and help the climber on the surface catch the fall. Knotting the rope is popular in the guiding community, and in the guide courses and exams I’ve observed over 10 years, knots have caught and held a climber who fell into a crevasse at least half the time. Clipping to the rope instead of tying in to it lets you easily escape the rope to rescue your partner in the crevasse. 2. THE FIRST STEP after catching the fall is to build a solid anchor and transfer the load to that anchor. Many people transfer the load to a friction hitch, but it’s faster and more secure just to clip the anchor to the figure-eight knot you are already clipped into, and slowly ease the weight onto the anchor. If the anchor is less than bomber, back it up before unclipping from the system. Once you have created a solid anchor, unclip from your original knot, and put a friction hitch on the back (non-loaded side) of the rope. 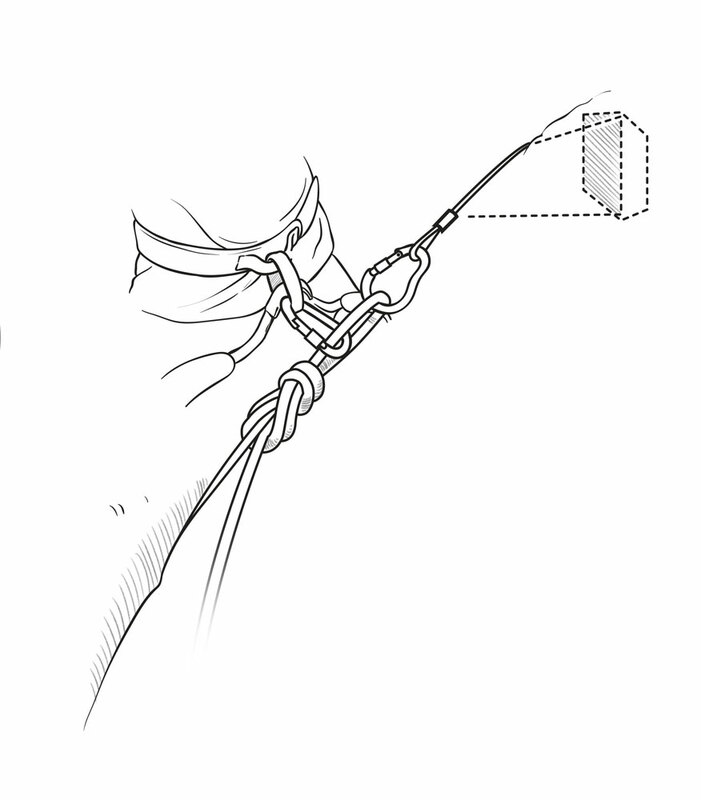 The friction hitch is your self-belay for approaching the lip of the crevasse. Use a long tether on the friction hitch—a double-length sling clipped to the friction hitch is usually the perfect length. Since the side of the rope you are using will eventually be weighted by the hauling system, the sling’s extra length will allow you to move freely while hauling. Carefully approach the edge of the crevasse, making sure not to collapse the lip onto your climbing partner. If you can talk with your partner, have him tell you where the lip appears the most solid. 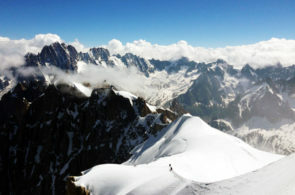 Once you have determined where the lip is solid, remove any fragile snow so you can stand on the edge of the crevasse. Since you don’t want to send snow down on top of your partner, you may have to create a new hole off to the side. 3. AFTER PREPARING THE LIP, drop a loop of rope with a Petzl Micro Traxion attached. Make sure the teeth on this device are biting onto the strand that is going back to the anchor, not the strand going into the pile of excess rope. 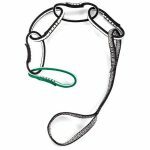 Have your partner clip this device to his belay loop, straightening any twists in the rope. After he has engaged the teeth of the device, you can start hauling, using the 2:1 advantage provided by the pulley built into the Micro Traxion. 4. THE MOST EFFICIENT WAY to haul is to put the rope over your shoulder, similar to how you would do for a shoulder belay. 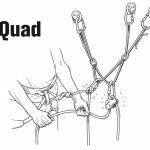 Squat, lock off the shoulder belay, and stand. If your partner is able to help, he can pull down on the “fixed” side of the system as you stand. 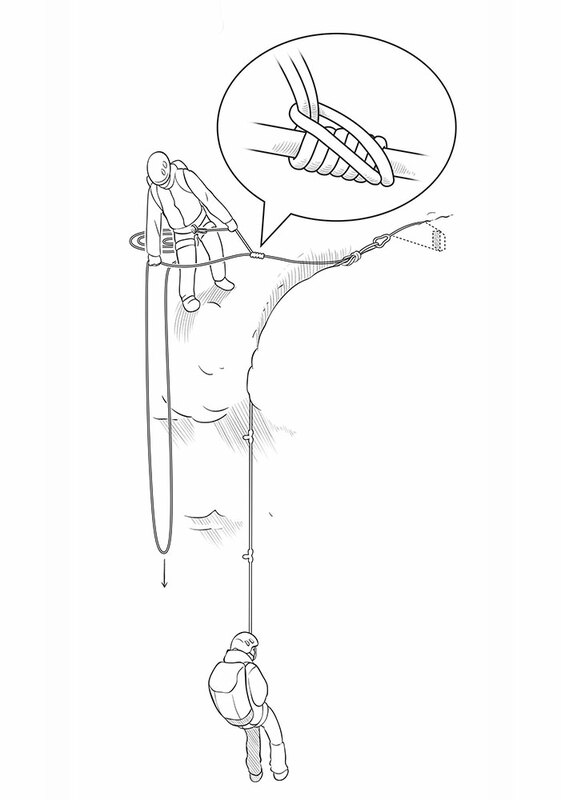 Even if he is unable to help, you should be able to haul someone out of a crevasse with just a 2:1 pulley. 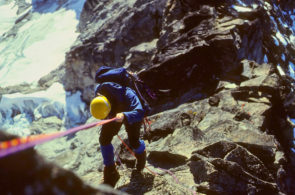 Self belay with a klemheist or prusik, carefully approach the lip of the crevasse, and lower a loop of rope to your fallen partner. Squat, reel in slack, then stand to hoist your partner out of the crevasse. Your partner should help by batmanning on the rope that caught him.